Why not use our Flower Delivery Lisnaskea service. As a leading flower shop in Enniskillen, Flowers by Sylvia are ideally placed to send flowers to Lisnaskea and other surrounding areas. As a well-established Fermanagh Florist, we are the trusted choice for anyone who needs a Lisnaskea florist. We are based in Enniskillen but happily delivery flowers to other towns and villages in County Fermanagh. So if you need Flower Delivery Lisnaskea, please feel free to use our online order and delivery service today. 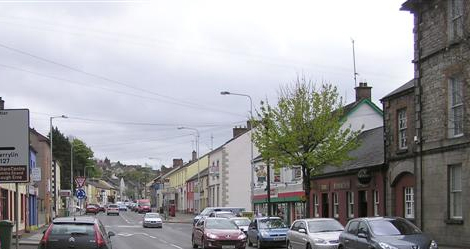 The second largest town in County Fermanagh, Lisnaskea is situated close to the shores of Upper Lough Erne. The town is located around a long main street. Some of the buildings in the town date back to the Plantation era. One building of interest is the workhouse, erected circa 1841. As a result, it housed up to 500 people upon declaration of the Poor Law Union in the area. See the following website for some more information on the Lisnaskea Workhouse. Another historic building in the town is Castle Balfour, erected circa 1618 by James Balfour. Today a portion of the castle is in ruins but a substantial part of the structure is intact and has been maintained over the years. The Lisnaskea Library is a good example of modern building within the town. April 2015 saw the new £1.28m library building officially opened. Built with a stylish and modern architecture, the library comes furnished with 2 floors containing excellent facilities such as computer and study areas, conference room and ample space for exhibitions. The beauty of the lakelands and waterways of Fermanagh make it a popular tourist. On the outskirts of Lisnaskea is the Share Discovery Village. This 60 acre site on the shores of Upper Lough Erne, is a popular activity and camping resort. Share provides a range of activities suitable for families and residential groups, team-building weekends etc.